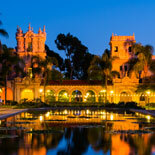 Highlights include the Historic Gaslamp Quarter, Balboa Park, Coronado Ferry Landing, The Embarcadero and more. At the end of the tour, take your ticket to the Top of the Hyatt for 50% off all wines and panoramic views. Restrictions apply. 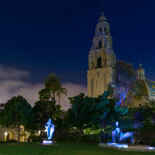 San Diego’s famous sights illuminated at night. 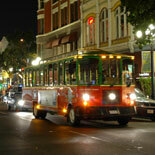 Hop aboard Old Town Trolley Tours for a picturesque evening you won’t forget. San Diego sparkles at night what better way to see it than with Old Town Trolley Tours! With the help of our expert guides, you’ll take in romantic views of the city and cruise past notable landmarks, experiencing them like you never have before. See San Diego in a different light. This 1 hour and 30 minute journey starts off by exploring the West Coast’s premier entertainment district known as the Gaslamp Quarter. Famed for its vibrant nightlife, bright lights and Victorian architecture, it will captivate your imagination of what makes this urban playground unforgettable. We’ll then make our way to Balboa Park, the largest urban cultural park in the US where it’s transformed at night by stunning buildings, fountains, and statues glowing bright that are equally as remarkable in the evening as they are during the day. From Balboa Park we’ll drive to the top of Coronado Bridge for more spectacular sights including the lights coming in from Tijuana, Mexico, the bay and downtown San Diego. We’ll then travel to Coronado’s Ferry Landing for a 15-minute stop to take in the stunning beauty of the San Diego city skyline visible from across the bay and a perfect photo-op location. 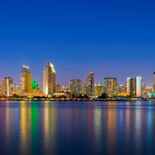 From Coronado, we make our way to the Embarcadero’s bayfront views. You’ll see the Historic County Administration Building, Maritime Museum’s Star of India, the USS Midway Museum, Seaport Village Headquarters, and we’ll also see the Navy’s aircraft carriers from across the bay. At the end of the tour, take your drink voucher to Top of the Hyatt, and enjoy breathtaking floor-to-ceiling panoramic views of San Diego at the top of the tallest waterfront hotel on the west coast. And with that, you’ll have experienced America’s Finest City in another light, something you won’t forget. San Diego sparkles at night. What better way to see it than with Old Town Trolley Tours? Hop aboard Old Town Trolley Tours for a picturesque evening you won't forget. 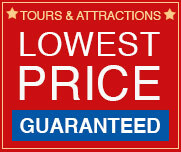 See online reservations for specific tour dates and times. No tours offered during December. Reservations are required. Guests must check in 30 minutes prior to departure. Late check-in may result in forfeited reserved seat. Reservation based tickets are non-refundable. You may reschedule up to 24 hours in advance of tour time by calling 619-298-8687. FREE SHUTTLE SERVICE offered from Old Town, 4010 Twiggs Street to and from Seaport Village for tour. Shuttle leaves 1 hour before tour time. Please arrive 30 minutes prior to shuttle departure. For more information call 619-298-8687. Due to traffic congestion and time constraints, we do not visit the Gaslamp Quarter sign or the Hotel del Coronado. Holidays, special events and traffic conditions may cause cancellations, delays or detours. Accessible: Reservation for accessible Trolley must be confirmed 24-Hours in advance. 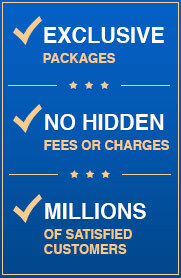 Please call Customer Service at 619 298-8687. Please dress appropriately as there may be cool temperatures at night. Part of the tour involves walking, so wear comfortable shoes.